This tradition of cheese tasting was recently brought to Violeta Chinni’s French 3 classroom at Galion High School. Her students were introduced to six different cheeses with various tastes, smells and textures. The cheese selection ranged from soft cheeses with a natural and washed rind; pressed and cooked cheeses; to blue-veined and goat cheeses. The cheese tasting menu included five French cheeses: brie, Camembert, muenster, blue cheese, chèvre goat cheese and one Swiss cheese, gruyère. In French 1, students are introduced to basic food vocabulary and French meal etiquette. Students venture out to create grocery shopping lists and party menus in French 2. 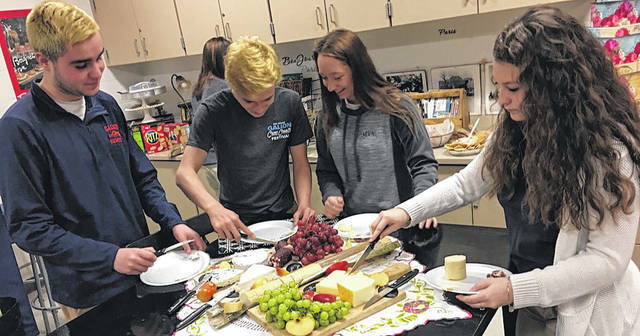 French 3 goes further into cultural explorations, which makes cheese tasting a perfect way to expose students to a new cultural experience while giving them an opportunity to expand their taste buds. Much like in France, all cheeses were served on a wooden board accompanied with red and white grapes, apple slices and pieces of French baguette. Chinni said that teaching students about French cuisine is closely connected to Galion High School’s Culinary Arts program. The cross-curricular connections do not end with the Culinary Arts Program at GHS. After the cheese tasting, the French 3 students completed a 10-question survey ranking each cheese they tasted, identifying their favorite and least favorite cheese, and voicing their opinions about the overall experience. Once the survey was completed, the students analyzed the results and had a graded discussion on Canvas, the school’s Learning Management System. According to the survey, muenster, the soft cheese with a washed rind was students’ favorite while blue-veined blue cheese and brie, the soft cheese with natural rind, were students’ least favorite. When asked if they enjoyed the cheese tasting experience, 68.75 percent of students said yes, 6.25 percent said no, and 25 percent said somewhat. To complete their cheese experience, students brought a few American cheeses for comparisons, a ham and cheese ball, and English teacher Cay Faulkner contributed cheddar and broccoli soup.